Hardy pioneer settlers began coming in 1789, to what was then known as the “Lake Country,” part of Onondaga County at that time. This area was to become Cayuga County in March, 1799. Ten families in a wagon train from Conewago arrived on July 4, 1793, when George Washington was President. Some of these settlers met at Col. John Hardenbergh’s cabin to organize a church Sept. 23, 1796. The first “church,” built of logs, was erected in 1797. This meeting house, measuring 25’ by 30’ with galleries on three side, sat high on the bluff next to Dutch Hollow Brook overlooking Owasco Lake. Worshippers came from both sides of the lake. After worshipping in this log meeting house, located at what is now known as Burtis Point, formerly Brinkerhoff Point, for 18 years, the ever-growing congregation of Dutch and French Hugenot pioneers decided by mutual agreement to split. 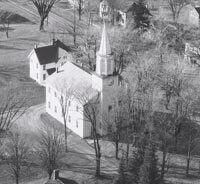 Those on the west side of Owasco Lake formed the Sand Beach Dutch Reformed Church and those on the east formed what is now Owasco Reformed Church. The Consistory decided to build a new edifice on a small knoll at Bevier’s Corners, hamlet of Owasco, on land donated by Martin Cuykendall. The Consistory, on October 10, 1810, included names like Brinkerhoff, Johnson, DeWitt, Selover, Bodley and Hornbeck. The church is part of Montgomery Classis, Synod of Albany, Reformed Church in America. 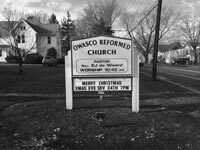 Owasco Reformed Church is the oldest church in the county held continuously by the same denomination. As they cleared the land, the pioneer families stockpiled lumber to build their own homes and barns. Many families donated that stockpiled lumber for the new church, delaying their own building. The support and sill beams for the church were hauled by oxen from Dryden during the construction between 1811 – 1815. The congregation met inside the shell of the new church building on Sept 8, 1813. Outside were their horses, wagons and carriages. 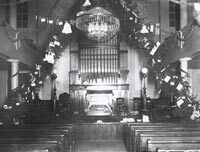 They agreed to finish the meeting house by pledges for the “lath and plaster” and by selling pews. Slaves and servants who did not buy their pews sat in the galleries. Much of the area was settled by Revolutionary War soldiers who were given land grants in payment for their service. 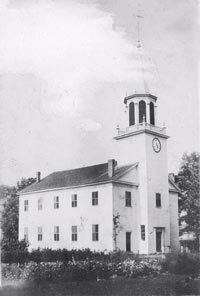 In 1816 the largest increase in membership was recorded, 370 people, one year after the church was completed. That year was known as "The Year of No Summer.” People were frightened and thought the world was going to end. The pastor was kept busy visiting people and reassuring them. A former slave Major Courtright gave $10 of his hard earned money to purchase the first bell in 1853. At the opposite end of the economic status, John Davison contributed money for the pastor’s salary in the 1830s on four subscription lists. Davison was the grandfather of John D. Rockefeller. The Ladies Aid Society was organized in 1883. The women supported the Civil War by making bandages. 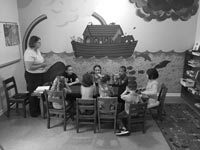 Mission work was continued by the Women’s League in 1933 and is continued now by the present day Women’s Guild. During the 1930s depression, there was only $36 left in the treasury. It was suggested that the 1820 melodeon be sold. 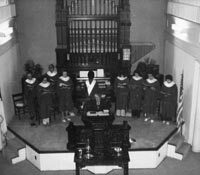 It was the first musical instrument in the church and because it was part of the church’s history, it was not sold. The church has supported 33 ministers over its 200 year existence. We continue sharing the Gospel of Jesus Christ in this hamlet, as we continue the upkeep of this historical building and parsonage. 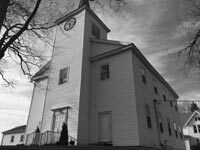 Laurel Auchampaugh, town of Owasco historian, has preserved many of the historical records of the church and she has many fascinating historical stories to share as well as many records concerning families that have roots here. To contact her e-mail owascohistorian@centralny.twcbc.com. You can also check out www.rootsweb.com. If you would like to help us insure that this venerable building continues to stand in the hamlet of Owasco as a testament to the pioneers that built it on faith, please contact us at 315-784-5047 or at the address at the top of the page.